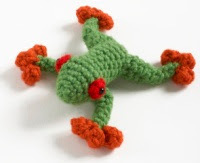 My mother loves frogs, so I'll definitely be making this tree frog of the amigurumi kind for her this Mother's Day (the 2nd Sunday of May, here in Australia). I love frogs as Your Mom does, I may be as old as she is or even older. I would love to learn how to make such lovely frogs as you do. Do you think that is possible? I am from Finland.